Normally a garage is filled with the sound of running engines, machinery and tools – but on Nov 20 it was the sound of music that echoed through our workshop. The Bridgnorth Sinfonia put on a special concert for over 100 lucky people and performed a range of music from classical to the more modern. The Sinfonia was conducted by Dr James Ross who has a wealth of musical experience conducting over 850 works in 15 different countries throughout Asia, North America and Europe. Guests were able to soak in the pre-concert atmosphere with a glass of bubbly and nibbles taking in the unique surroundings not often seen as a venue for a musical event. 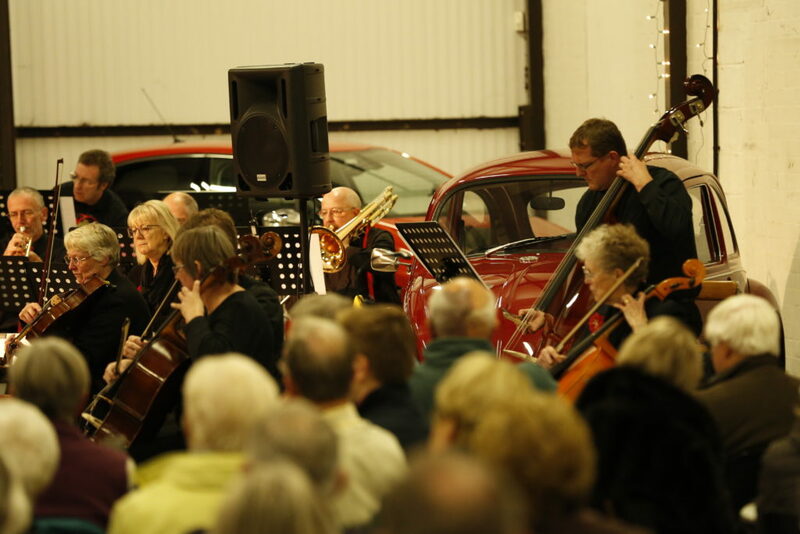 Set against the backdrop of a classic VW Beetle and Mini Dr Ross lead the Sinfonia through a beautiful rendition of classical pieces. When the time came to play something more recent they did so with the help of singer Andy James and included an arrangement of a Beach Boys hit. The Bridgnorth Sinfonia were formed in 2009 and is made up of amateur and professional musicians from the local area who rehearse in St John the Evangelist Church hall. At David Dexters we’re very much part of the local community in Bridgnorth and were delighted and proud to support such a talented group of musicians and composer. The event was a huge success and we are already turning our attention to holding something similar in the summer next year where we can open up our doors once again. We’d like to thank all who were involved, including the Bridgnorth Endowed School who kindly lent us chairs for the evening, and of course to all of the musicians of the Bridgnorth Sinfonia and conductor James Ross.